People who feel like using high-vis should feel free to do so. But the official promotion of high-vis over everything, including lights, is for many reasons — from inconvenience to dangerisation — the opposite of cycling promotion. Thus it is likely to stand in the way of one of the most proven safety effects: safety in numbers. Watch the above video before reading on and count the number of passes the white team makes. How many passes does the team in white make? Did you see the Moonwalking bear the first time? High-vis as a solution to poor or inattentive driving does not take psychological and social behaviors into account. The inattentional blindness or perceptual blindness shown in the video above is a psychological lack of attention and is not associated with any vision defects or deficits. You can read and watch more at the Invisible Gorilla website. On there the authors of the original research, Christopher Chabris and Daniel Simons, show that when you get people to watch out for the Gorilla, they’ll miss a whole lot more. That’s just looking for trouble — unless somebody has come up with a way of making everybody who walks and cycles wear high-vis. Inattentional blindness could partly explain what leaves UK users of bicycles and motorbikes with the saying “Sorry mate, I didn’t see you”, known as SMIDSY. As one YouTuber explains in the description in a video (verbal reaction not safe for work) where two drivers fail to yield to him when he is already on a roundabout: “…Clearly indicating, hi vis clothing, flashing bright lights – apparently it’s not enough.” There’s also Irish examples of this in both dark and light conditions. This is mirrored by stories from people, on the Irish discussion website Boards.ie and elsewhere, who say they were “dressed like Christmas trees” — ie wearing high-vis and using bright lights — but still were in collisions or regullary have close calls with motorists overtaking or pulling out in front of them. Motorists — as shown in some YouTube videos — will also often contend that the cyclist were in the wrong or “came out of nowhere”. UK research Transport Research Laboratory and University of Strathclyde found that drivers are inclined to “criticise cyclists for relatively minor matters” but to “overlook or excuse driver transgressions”. This isn’t about blaming anybody or saying one of ok because the other does it, it’s about understanding mindsets. 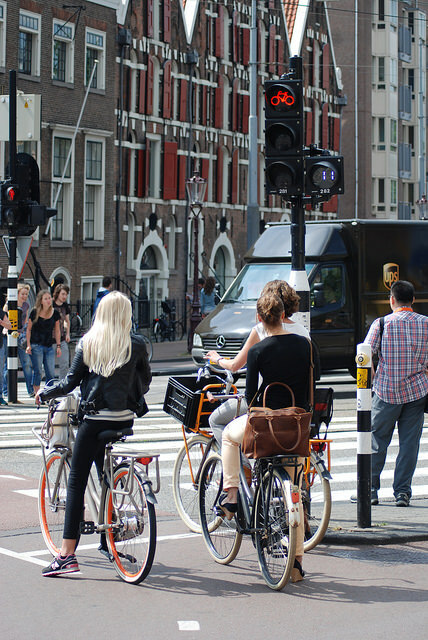 Seeing people on bicycles as members of out-groups could be linked back to why inattentional blindness occurs even when the person cycling as has high-vis on and lights on their bicycle. In plain English: It’s a case of “them and us”. So, “them” are cyclists (the out-group) and “us” are motorists (the in-group). The Dutch went with infrastructure changes rather personal protective gear; more recently Sweden has success with the same. Walker says there’s a lack of research around collisions at junctions where cars hit people on bicycles or motorbikes even — inattentional blindness — but there’s indications that motorists watch out for people on bicycles more in Cambridge or York where there’s more people cycling. This safety in numbers type of effect could explain why Dublin City has by far the largest concentration of people cycling in the country but the lowest death rate (hovering between 0-1 in the last five years). Unlike high-vis — which is at best on shaky ground — the safety in numbers effect has been found in research again and again. The very close to home and practical example of this is DublinBikes — there is a large-scale level of complaints that many of the users of the system are some of the most unpredictable and poorly behaved. Yet, the death rate in the Dublin City has fallen since the scheme was introduced. Clearly visibly is important. The law already requires bicycles to have reflectors and makes it mandatory to have a front and a rear light after dark. The promotional and enforcement approaches should cover cycling and use of lights, but it should mainly be aimed at the largest problem in terms of harm caused — poor driver behaviour. The current and massive Irish focus on high-vis for walking and cycling is highly unrealistic and so broken that it’s becoming a rather sick victim-blaming joke. Even if high-vis was a key to safety, it’s promotion has failed and it’s ultimately impractical for most people most of the time. Mayo County Council’s safety officer, Noel Gibbons — previously known for such effective measures such as getting the local priest to bless the roads — is clearly annoyed that how much the high-vis pushing has failed. Gibbons would be better served looking at his employer’s poor record — such as: building boom-time housing estates outside town boundaries and still to this day having no footpaths and cycle paths to the development; or having no footpath or safe crossing points between a child care unit and a housing area which it serves, leaving children and their parents exposed on a inner–relief road route. The Road Safety Authority (RSA) should also be familiar with a lack of a footpath — their HQ in Ballina is in a business park where one pedestrian gates is locked every time we’ve passed by and the other is welded shut. There’s also a missing section of footpath between the RSA’s business park and the town centre. In and around the town, footpaths and cycle lanes are narrow beside busy roads; the cycle lane network has large gaps in it; a one-way system of streets is hostile to cycling and walking; there’s a lack of pedestrian crossings at many locations; and speeds are high on urban road as is made cristal clear by electronic speed signs; and cycling. These things are mirrored across most of the country — and there’s no desire to fix them anytime soon. Strangely the RSA don’t see this, all they see is the dark country roads around the town. It’s staff also apparently miss the town’s electronic speed limit signs which show how wide-spread speeding is within the 50km/h zone. That review suggests that narrow country roads — the type where where you have to stop when you meet oncoming traffic — with 80km/h speed limit sign on them should be replaced with another sign which would not change the limit or add any extra obligation to drive safely. Sub 50km/h limits are mentioned as if they were experimental limits not already used in Ireland or across the world. All of the above shows that not only is high-vis not proven and impractical as a population-level solution, it’s a distraction from real solutions. Why are the RSA so afraid of lower speed limits? They are stuck in a world and mindset where there’s no need for safer streets and roads for walking and cycling. Where high-vis is not just a stop-gap measure, but a solution. Pedants please note: High-vis in this article should generally been seen as a reference to the most common high-vis vests which have reflective strips, which are handed out by the RSA etc. The mindset within the RSA, DoTTAS and Garda that thinks the solution is hi-vis (or lit up like a Christmas tree) has to be challenged. As a driver I believe I have a better chance of not hitting a cyclist if I can see them. As a cyclist I believe that wearing bright and/or reflective clothes makes me more visible to other road users in certain conditions. As both I often wonder how many people have been put off cycling by seeing others were high-viz clothing. In my experience, when I show up for a meeting and hang up my high-viz jacket and helmet, the more likely comments are “what’s it like on the bike today?” or “how long did it take you to get here?” If I have walked or taken the bus, the issue of transport rarely comes up. Excellent article, Cian & hard to argue with such evidence. Cycling, I wear hi-vis myself, even in streetlit areas. I have had recent correspondence with the RSA, which I have suggested be followed-up by Cyclist.ie, on foot of their ‘Be Safe Be Seen’ press release for winter solstice. I put it to Moyagh Murdock that more emphasis should be placed on driver behaviour. She replied that the RSA already campaign strongly on speed and driver attention. RSA are firmly stuck behind a windscreen when it comes to road safety. Are you making RSA aware of this article? Perhaps if the moonwalking bear in the video had been wearing hi-vis? The point is it feeds into and exacerbates danger. t does not matter what you wear or if you are running lights if the driver does not look. I had by chance an Adidas hi-viz shirt on and was running my 80 lumen light as per normal but it didn’t help here [Video]. That said in early December I did a six day tour which involved riding on a highway at times with a lot of truck traffic, we are talking three trailer road trains here (Australia). Wearing that Adidas shirt helped I feel in allowing the truckies to see me earlier than maybe they otherwise they would and hence allowed for better planning for safe passing. I only coped one or two truckies being prats on some days. The rest and we are talking 20 to 30 trucks passed safely. All up it just added to making to it a workable situation with all concerned. I don’t believe that there is a blanket it works/does not work position, rather it should be considered given the riding circumstances. I don’t as a rule bother wearing it on my commutes, but I do wear it on night Audax rides (required) and I will wear it on sections of my tours where I am highways or high traffic routes. Well, even Safety in Numbers is not so certain. Even Jacobsen himself in his seminal paper had to “interpret” UK’s data that did not fit his model to defend his theory. Even very recently, with much more cyclists in London and yet many parts without anything but paint on the road to make it a “cycling superhighway”, it was shown that there was no separation, the crashes increased with the number of cyclists, there was no Safety in Numbers for these parts. Also, in several towns, bike-sharing increased suddenly a lot the number of cyclists, and yet no Safety in Numbers was observed either. “better infrastructure” > “more cyclists” > “and a lower crash ratio”, seems definitely proven. but “more cyclists without better infrastructure” > “lower crash ratio”, seems not proven at all, and with bike-sharing a good way to test it, it even seems disproved. I don’t understand the opposition to wearing High Viz. While cycling infastructures do need to be improved and driver behaviour is sometimes ridiculous. Wearing something that makes you more visible is clearly the easiest way to take some personal responsibility for your own safety. I was a long time cyclist before I got lazy and upgraded to a motorbike. On the motorbike I wear a white helmet because it stands out against the black road surface I also wear high viz. I would have definitely seen the bear if it was wearing hi viz. @NotSoSure safer in numbers is an effect, it’s not a measure (as some claim or think it is). The measures which bring about safety in numbers includes segregated routes. And even with the safety in numbers effect present, you can still safe lives by tackling junctions with proper segregation. @Brendan: Have you actually read the full article? If high-vis is the solution, why are cyclists with it continuously getting hit, along with truck drivers continuously hitting bridges etc with high-visibility strips and markings? @Cian You’re getting high viz and forcefields mixed up! @Brendan What exact problem to you think high-vis solves? @Brenden the problem is inattentional blindness or perceptual blindness, visibility is an excuse. “Sorry I didn’t see you” or “they came out of nowhere” is said when they should be saying “I was not expecting or looking for a cyclist / motorcyclist”.